Inder Loves Folk Art: Slow-Cooker Yogurt. I have fond memories of the homemade yogurt my mother used to make when I was a kid. I remember, it was a little runny, and a little tart, and very delicious. But I also remember that it was a bit of a pain to make, and involved carefully monitoring the temperature of the mixture, for hours. As you know by now, I love the challenge of making ordinary things (dinner, clothes, bread, vegetables) from scratch. There is a unique sense of accomplishment that you get in doing something "the hard way." But until recently, even for me, yogurt-making seemed like a lot of work and babysitting for a product that (a) I don't eat that much of; and (b) isn't that expensive. What changed? Well, yogurt is now one of the five foods (or is it four?) that my incredibly picky toddler will actually eat. And you know what, it is kind of expensive, especially if you buy two cartons of the organic kind every week, because it makes up a quarter of your child's diet. So I recently started eying internet recipes for "slow cooker yogurt." This supposedly foolproof method seemed easier than the more old-fashioned method, in that it does not require that you closely monitor the temperature of the milk. According to the hype, you just have to set a timer. Warm up the milk, cool it down, add the starter, go to bed. It turns out I only like to make things from scratch when it works. When it doesn't work, I get really, really whiny. Just ask Steve. Let it never be said that I only blog the positive, right? But a particular Facebook friend taunted me with stories of her delicious, thick, creamy homemade yogurt, which she was serving with homemade granola, oh yum, kill me now. Well, I was not going to let a half-gallon of scalded milk beat me! So I tried again. But this time, I did extensive research on the ideal environment for culturing yogurt. I broke out the candy thermometer and, you guessed it, monitored the temperature. Since I was a bit anxious about this second endeavor, this meant checking the temperature approximately every five minutes for five hours straight. I was trying to make bread at the same time, but in my yogurt-obsession, forgot all about the bread and let it overproof (it turned out fine - yeast is a lot more forgiving than those persnickety little yogurt bacilli). If you want the technical details, it went like this: I heated a half gallon of milk in the slow-cooker on "High" to 180 degrees (about 2.5 hours). Then I let it cool slowly, stirring occasionally, to 115 degrees (another 2-3 hours). Then I added the starter (a half cup of plain yogurt), tempering it first with some of the warm milk. Then, after I baked my bread, I wrapped up the crock pot and stuck it in oven (warmed to about 115 and then turned off) to culture overnight. My hands were trembling as I removed the cover and saw ... TA-DA! Yogurt! Unmistakable, thick and creamy YOGURT! A little bit runny, and very tart! I danced around the kitchen with joy. Joe wasn't sure what we were celebrating, but he's a good sport and joined right in. Stored in one of our many extra yogurt containers! So in the end, making yogurt turned out to be just as fussy and finicky as I remembered from my childhood. But though this may look like a just homely quart of plain yogurt (the batch made two quarts, by the way), to me, it tastes like success. Delicious. * To be fair, the timing-only method probably works great for people who, you know, heat their homes. I suspect that my first batch of milk cooled much more quickly than the recipe accounts for in my drafty old house, and thus, it was too cold when I added the starter for the culture to grow. Wow, that sounds like a lot of work, but I'm glad it turned out well for you. I'm fascinated by the 'Australian style' yoghurt container. 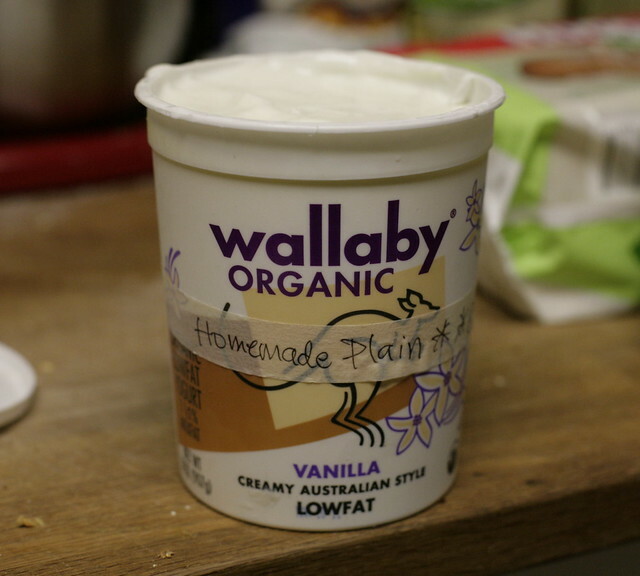 An Aussie myself, I wonder what constitutes Australian style yoghurt? No idea, except maybe the pronunciation haha! Sorry to have taunted, but I'm glad it got you to try again. The batch I was so thrilled with yesterday seems to have separated out in an unpleasing way, but don't get me wrong, I'll still eat it. Next time I will cook a little shorter, and maybe try lowfat milk (instead of non fat). Jane: It tastes just like regular yogurt! No obvious difference between Australian-style and you know, regular-style. :-) Isn't it fun to know that you are considered "exotic" somewhere, though? Lisa: I hear you can strain off the whey if it separates, and make greek yogurt (now there is a genuine STYLE of yogurt)! Sooo impressed. Granola will be a cinch compared to yogurt. I have a really simple recipe if you're interested, but recipes are easy to come by and generally forgiving I think. The yogurt is quite inspiring. I'm trying to decide if I'm up for the neurosis I know it will activate in me. Oh, the temperature taking! I love homemade yogurt. Leaving the oven light on helps... I also set a couple big bottles of hot water in there as well. As far as taste and consistency goes, I have found that which brand of yogurt I use for the starter makes a huge difference. My favorite is the Stoneyfield Organic Greek Yogurt. It's not the cheapest but the resulting yogurt is thicker and much less tart- it's really, really good. Ooh, thanks Robin, I will try that!